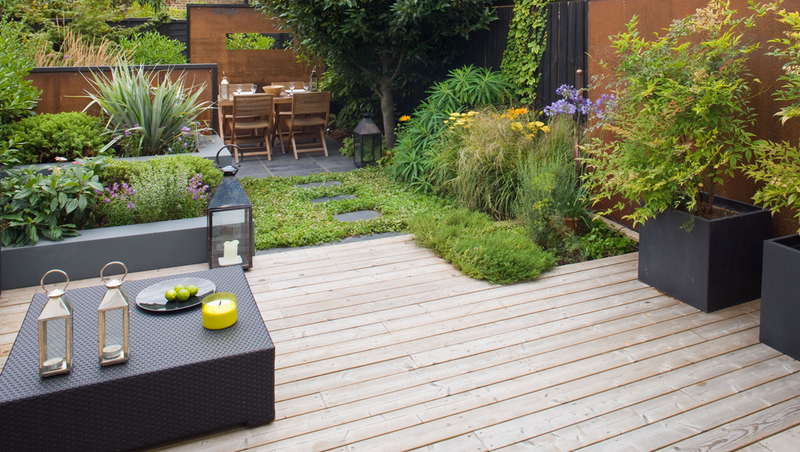 This garden was created for a young professional couple who’d just finished refurbishing their new home in this sought-after part of West London. Being very design conscious, they had chosen a very interesting selection of furniture pieces by the best contemporary designers, put together with great flair and a particular love of colour. Their house is not your obvious minimalist white interior but a very personal and lively explosion of rich colours against neutral backgrounds. 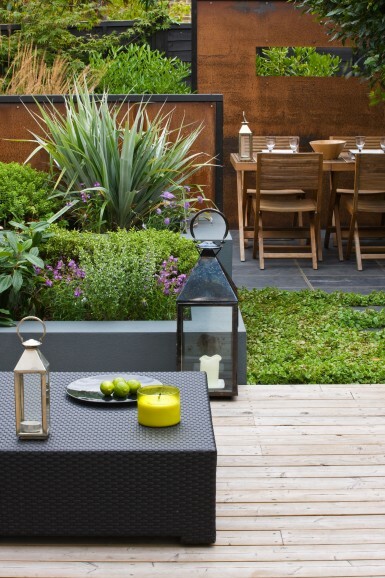 They wanted a garden that stylistically reflected their taste for cutting-edge design but, functionally, they wanted a friendly space where they could relax as a couple and also fulfil their love of socialising. 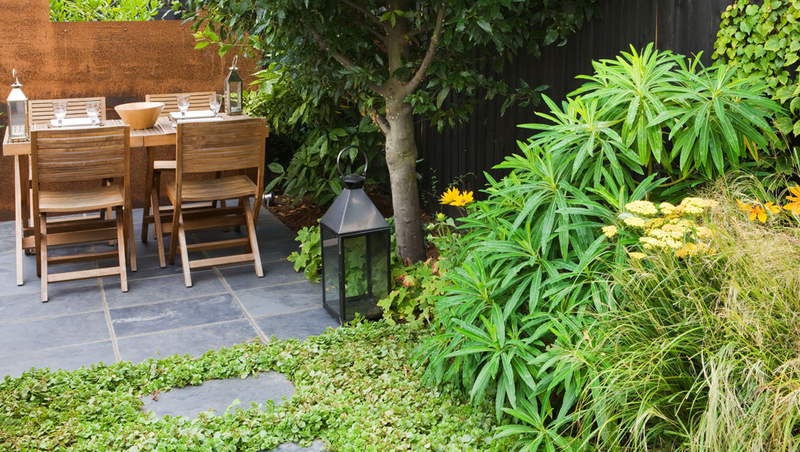 The garden design solution was to create a layout which offered flexibility: open enough to accommodate large groups at parties but with some secluded areas for more intimacy. To achieve this, we came up with the concept of interplay between revealed and concealed spaces. As you move through the garden, different areas and viewpoints are created, through the use of mild steel partitions, at different heights and widths, some with laser cut windows. 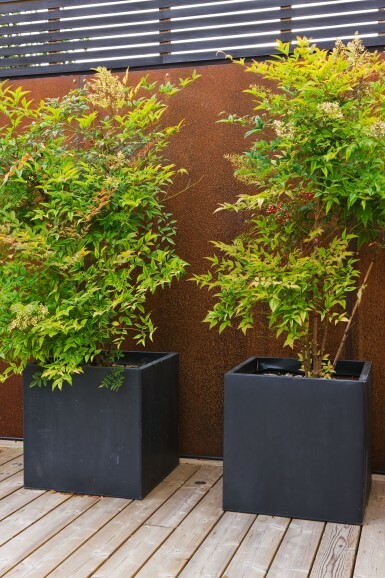 Mild steel, being the product of an industrial process, is a very contemporary looking material; however, the added beauty of it is that, as it ages the outdoor elements alter its appearance. 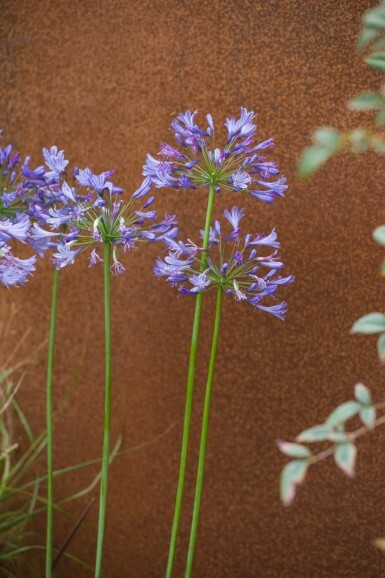 It starts out as a very dark bluey/black colour with fascinating horizontal/stripe shade and texture variations (like a Richard Serra sculpture) but, over time, it oxidises and turns a rich rust colour. This organic process makes an initially very alien and industrial material become part of nature. 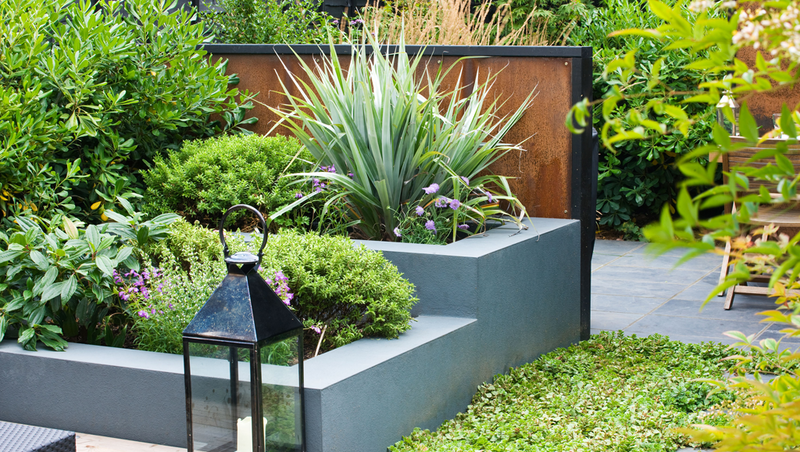 Rendered raised beds at different heights, rich with lush planting, offer a focal point from the live-in kitchen and double up as seating for parties. These were painted in Farrow and Ball’s Downpipe, a very dark grey with a hint of blue, which perfectly complements the steel and black slate used for the dining area. The planting is mainly structural and evergreen: Pittosporum tobira, Astelia chathamica, Euphorbia mellifera, Hebe rakaiensis and Nandina domestica form the backbone of the planting, softened by grasses such as Stipa tenuissima and Anemanthele lessoniana. The client’s love of colour is catered for by the addition of herbaceous perennials such as Geranium ‘Patricia’ and ‘Rozanne’ on a ground plane and Veronicastrum virginicum ‘Lavenderturn’ and Monarda ‘Beauty of Cobham’ higher up, mixed by the invaluable Calamagrotis x acutiflora ‘Karl Foerster’.